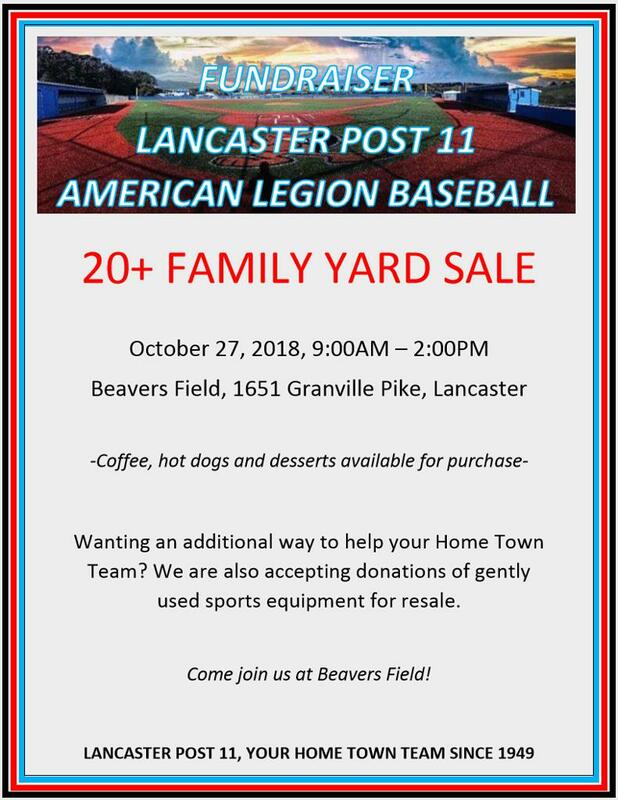 Lancaster Post 11 will host a 20+ family yard sale at Beavers Field, 1651 Granville Pike, Lancaster, on Saturday, October 27, from 9AM – 2PM. The yard sale is a fundraiser to help offset tournament fees and hold our player costs to a minimum. Baseball can be expensive and Post 11 is working hard to keep the costs reasonable for our families while providing a tournament experience comparable to other area teams. Coffee, hot dogs, desserts and refreshments will be available for purchase during the yard sale. Please join us, Saturday, October 27th from 9AM to 2PM to help raise funds for Lancaster Post 11 American Legion Baseball.